Gem Quality CVD Diamonds: Grown by chemical vapour deposition (CVD) Synthetic CVD diamonds, have rapidly improved in recent years due to advances in growth techniques and post growth decolourising treatments. Near-colourless CVD synthetics have now passed the three-carat threshold. HRD Antwerp, September 2015, received a 3.09 ct sample (I colour, VS2 clarity). Pure Grown Diamonds announced earlier that they had successfully grown a 3.04 ct synthetic (I colour, SI1 clarity) Dec 2014. GIA’s New York laboratory recently tested two large CVD synthetic diamonds submitted for grading services. The largest CVD-grown diamonds GIA has examined to date are these two synthetics. The results of the examination underscore the continued improvements in CVD synthetic diamonds. 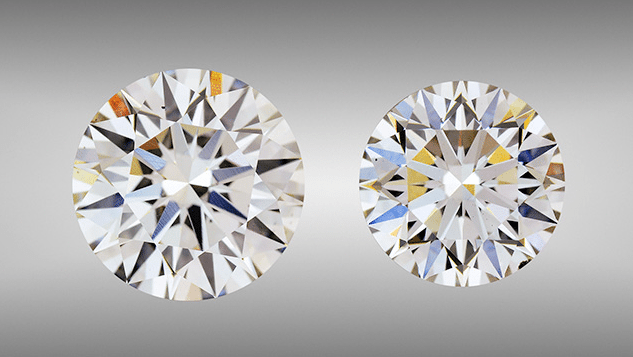 The 2.51 and 3.23 ct round brilliants received H and I colour grades, respectively. Identified in each stone were pinpoints, and black inclusions. Observed in the 2.51 ct round were some small fractures along the girdle. The 3.23 ct synthetic contained a small black inclusion measuring approximately 125 µm. Therefore the 2.51 and 3.23 ct were given clarity grades of SI1 and VS2. Irregular stress patterns with high-order interference colours when viewed under cross-polarised light , indicated high levels of internal strain. High quality CVD synthetic diamonds are , without post-growth decolourising HPHT treatments by the analysis, done by both HRD and GIA, marking a significant improvement in CVD growth. Using advanced spectroscopic and fluorescence imaging technologies, it is nevertheless possible to detect low concentrations of impurity centers, allowing conclusive determination of these samples’ synthetic origin. GIA is monitoring the development of laboratory-grown diamonds and conducting research to ensure that we can continue identifying every single synthetic diamond. The synthetics showed weak orange fluorescence to conventional short-wave UV and were inert to long-wave UV radiation. Exposure to the deep UV radiation ( 230 nm) of the DiamondView revealed an overall strong red-pink fluorescence, which was attributed to nitrogen-vacancy centers with dislocation bundles that fluoresced violet-blue, followed by weak greenish blue phosphorescence. Grown using a multi-step technique and the crystals had a layered structure, thus maximizing production volumes. Sharp boundaries between different growth layers are a result of changes in the fluorescent impurity uptake during the start, stop phases, produced by applying at least five layers. Dislocation bundles propagated throughout the material. We don't understand the two blue bands of highly concentrated dislocations crossing the table of the 2.51 ct.